KOBE AND CO. YOUR NEW NBA CHAMPIONS! An EA SPORTS videogame simulation of the entire 2008-09 season using NBA LIVE 09 predicts that the Los Angeles Lakers will reach The Finals for the second year in a row, this time emerging victorious over the Miami Heat in six games. The 2008 NBA Champion Boston Celtics remain a force, finishing third in the Eastern Conference with 44 wins before getting upset in the Eastern Conference Finals by the Miami Heat. Despite struggling throughout the 2007-08 season, the Heat advance to the NBA Finals for the first time since their NBA Championship win in 2006. Houston Rockets’ Yao Ming completes an injury-free season and captures the MVP Award after posting 25.8 ppg and 11.1 rpg. Kobe Bryant of the championship winning Lakers leads the league in scoring with 27.9 ppg. Rockets’ Ming, Lakers’ Bryant and Pau Gasol, Celtics’ Paul Pierce and the Denver Nuggets’ Allen Iverson complete the All-NBA First Team. Memphis Grizzles’ OJ Mayo will take home Rookie of the Year honors. Randy Foye of the Minnesota Timberwolves is awarded Most Improved Player Award. In addition to capturing the NBA Championship, Lakers head coach Phil Jackson will take home Coach of the Year honors. A simulation is conducted by artificial intelligence or logic of the videogame that uses real-life data from each player. Results are extrapolated by the videogame when two teams match up based on player ratings, line combinations, and include variances such as injuries and hot streaks to give a realistic outcome of a game or series. Pre-season simulations make the assumption that teams will stay healthy and play a season without any big trades, which would alter the end result. 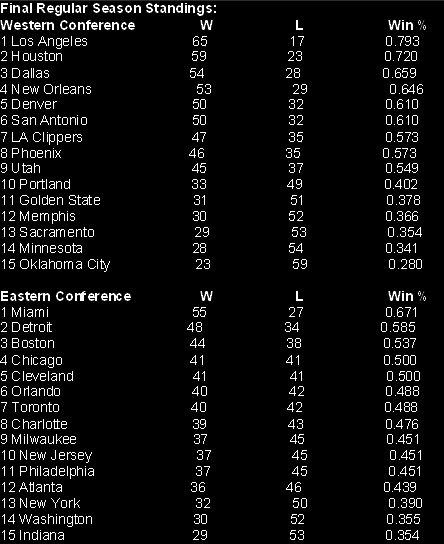 NBA LIVE 09 can now be used as a predictive throughout the season to simulate results of big match ups and the rest of the season with authentic data driving the artificial intelligence. Powered by Synergy Sports Technology – the premier analytics provider of NBA data for more than 20 NBA teams – Dynamic DNA emulates an NBA player with absolute precision. Synergy Sports Technology indexes each possession of every NBA game in real time. This data will drive the logic of the game and update every single day of the season to reflect what you see on the court in your virtual experience. 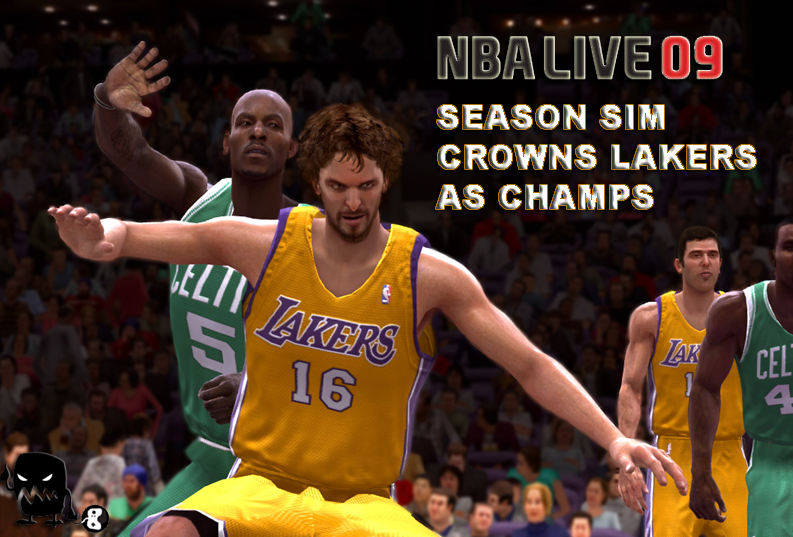 NBA LIVE 09 can now be used as a legitimate predictive tool and will be made fresh daily, with the start of the 2008-09 NBA season on October 28. ~ by consolecreatures on October 28, 2008.